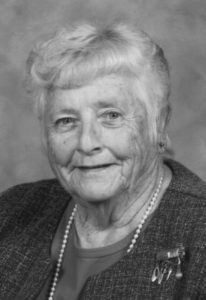 HELEN CHARLESWORTH (née Aitken), beloved wife of the late Albert Charlesworth, passed away at the Chinook Regional Hospital on Sunday, April 8, 2018 at the age of 90 years. Helen is the loving mother to Keith Charlesworth of Lethbridge, AB, George Charlesworth of Abbotsford, BC, Dale (Jo-Ann) Charlesworth of Creston, BC, Mark (Debi) Charlesworth of Welling, AB and Shelly (John) Guelly of Westlock, AB. She is also survived by eight grandchildren, five great-grandchildren, her sister Bev (Len) Herring and her son-in-law Ken Norman. She was predeceased by her husband Albert, her daughter Donna, her daughters-in-law BJ and Sharon and her siblings: Kay, Ron, Sheila and Gail. Helen was born in Lethbridge in 1927. She lived in Barrhill until 1968 and Picture Butte until 2013, before eventually returning to Lethbridge where she resided at Black Rock Terrace until her passing. She was a proud member of the Happy Old Timers in Picture Butte. Helen’s hobbies included golfing, camping, and she loved travelling to new places with her friends and family. Her grandchildren were her passion and the most precious things in her life. She will be greatly missed by all who knew her. The family would like to extend a thank-you to the staff at Black Rock Terrace, the nurses and doctors on 3C at the Chinook Regional Hospital, as well as Renae Peterson for all of their heartfelt care and compassion to Helen. A Celebration of Helen’s Life will be held at the LETHBRIDGE SENIOR CITIZENS ORGANIZATION, 500 – 11 Street South, Lethbridge, AB on Saturday, April 14, 2018 from 2:00 P.M. to 4:00 P.M., with a tribute to Helen being given at 2:00 P.M. In lieu of flowers and in memory of Helen, donations may be made to any charity of your choice.